The memory of spring flowers lingers beneath the mantle of winter. Embroidered blue flowers float on the ink-blue chiffon of this romantic top. 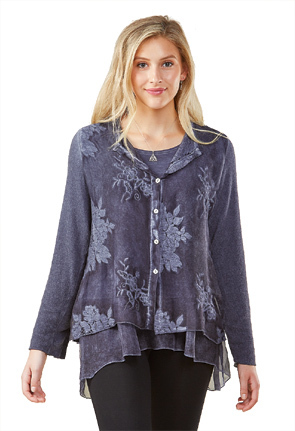 Chiffon front with soft sweater-knit back and sleeves flutters over a jersey-knit lining with voile ruffle hem peeking below. Enzyme-washed for coloring unique to each top. 30" long in back. Viscose/silk/angora blend; hand wash or dry clean. Sizes S-XL. Made in Italy.